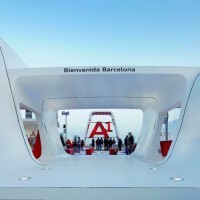 Schmidhuber + Partner designed the Audi AreA1 exhibit in Barcelona, Spain. 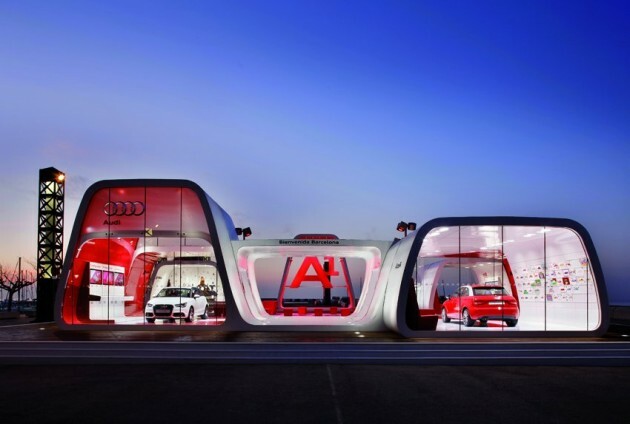 The AreA1 Roadshow – combining a distinctive mobile brand space and theatrical Driving Experience, to launch the Europe-wide marketing campaign for the new Audi A1. 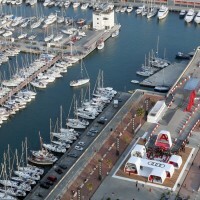 To launch the marketing campaign of the new Audi A1, the Barcelona waterfront was chosen to stage the AreA1, an intensive brand and product experience that combines a distinctive Audi brand space with a theatrical Driving Experience. The architecture projects a high value message, presenting the new Audi A1 in intricate detail as it targets the young, urban crowd. Visitors to AreA1 are led through a series of zones that follow a clear dramaturgy. First come several showroom modules that present the new A1 in perfect light. Next come exhibition areas designed to display product information, vehicle configuration and connectivity issues in a lively and engaging manner. The last stop on the visit is a small, central marketplace with a bar, seating, and WLAN. 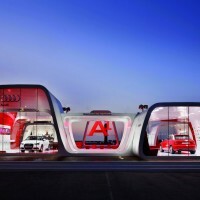 This meeting place is also the starting point of the Driving Experience, where visitors can join Audi instructors on a test drive of the new A1. The high-velocity journey incorporates full braking and sharp curves, before looping back into a sling test with 180-degree turnaround on a wet and smooth stainless steel plate, followed by a slow drive through the quarter pipe. 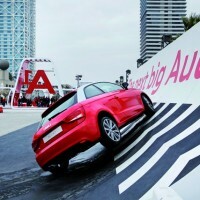 The driving course, which takes up an area of under 3,000 sq m, will allow anyone to discover for themselves that this new small Audi is the real deal. The design language of the modules was inspired by the A1’s single-frame radiator grill that forms a strong and recognizable modular brand architecture. 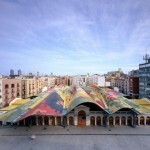 The different kit – from S (165 sq m) to XL (1,000 sq m) – are flexible in configuration and size, and produce a variety of spatial compositions, as well as open and closed perspectives. 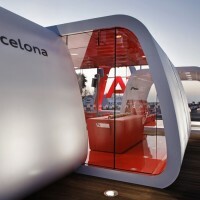 The AreaA1 Roadshow also features a 10 meters wide x 8 meters tall Audi A1 landmark that illuminates Barcelona’s entire coastline. The lighting rigs were designed exclusively for AreA1, with programmable light and sound systems to ensure a spectacular show at night. The customized display furniture has clear edges and no visible joints or seams, and was specially developed for the occasion and is suitable for outdoor use. The hard-foam material from which the desks and other furnishings are molded, is coated with a special rubber material to form a surface that delivers a unique and striking feel. 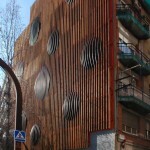 The entire structure sits on a slightly elevated 25 m x 34 m stage that is also constructed from high-quality materials. 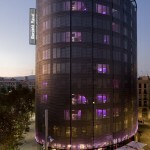 The stage integrates all the elements to create its own unique brand space in the middle of an urban environment – a true urban island in Barcelona’s prime location. 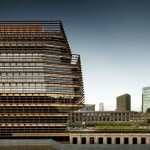 Visit the Schmidhuber + Partner website – here.